SEOUL, May 10 (Yonhap) -- The leaders of the center-left People's Party resigned en masse Wednesday, after its candidate's defeat in the presidential election. 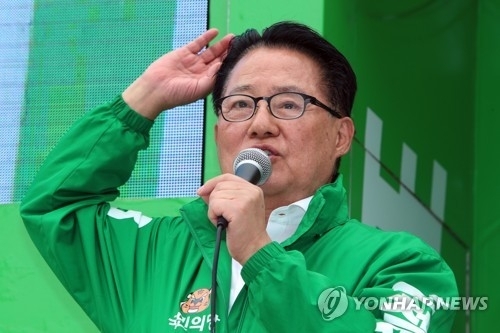 Rep. Park Jie-won announced their resignation during a disbanding ceremony of the campaign office of Ahn Cheol-soo. Ahn briefly emerged to challenge Moon Jae-in of the liberal Democratic Party in the run-up to the election, but ended third with 21.4 percent of the vote. "I take all responsibility for the election result and step down from the chairmanship," Park said. "I propose the leadership resign and go forward as a new party." He offered his congratulations to President Moon and thanked the people for voting for government change after 10 years of conservative rule. The election was triggered by the impeachment of former president Park Geun-hye over a corruption scandal. "The People's Party will contribute to resolving the pile of pending issues from the difficult economy to foreign affairs and national security," Rep. Park said. "Also, we will be true to the instinct of an opposition party."